The linkages between population and the economy vary greatly over the demographic transition. Many countries, mostly high income countries, are near the end of the transition and experiencing population aging and declining population growth. This raises concerns about economic stagnation and about the viability of intergenerational transfers systems: family support systems, public pension programs, and health care systems. Many countries, particularly in Africa, are still at relatively early stages of the demographic transition. Their populations are relatively young and experiencing rapid growth. Of great interest is the influence of population dynamics as an increase in the share of the working-age population and related changes has led to new opportunities for economic development referred to as demographic dividends. 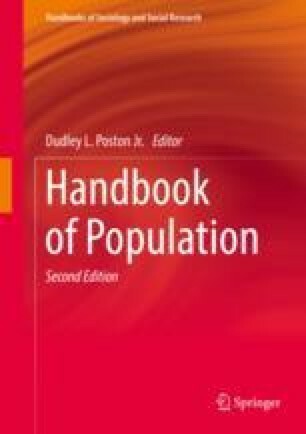 Economics research also addresses how changes in the economy influence demographic outcomes, fertility, mortality, and migration, which are addressed more extensively in other handbook chapters. United Nations Department of Economic and Social Affairs, P.D. 2017. “United Nations Database on the Living Arrangements of Older Persons 2017.” https://population.un.org/livingarrangements/index.html#/countries.